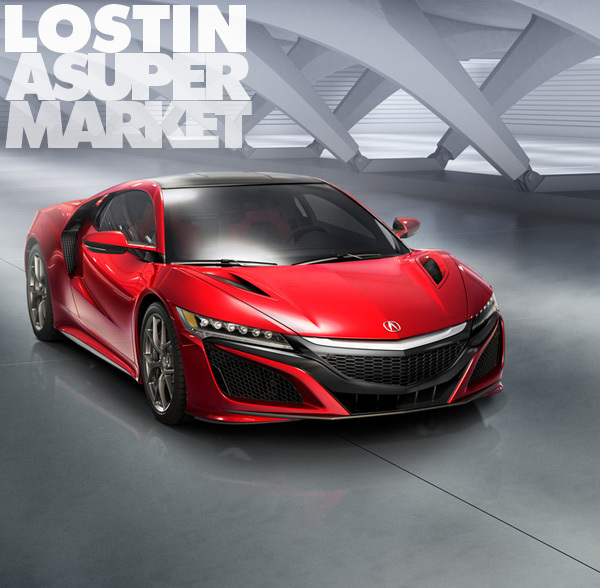 Originally dubbed the New Sports Experimental, the original NSX shattered expectations for what an affordable supercar could be — or rather, should be. The new, second generation 2016 NSX has lofty expectations to live up to. 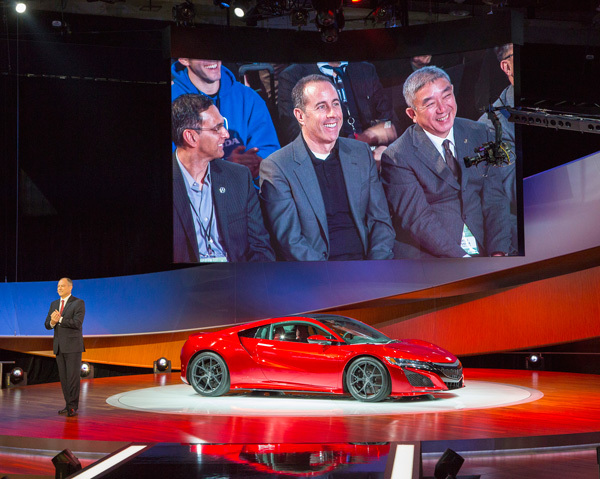 This morning Acura took the sheets off the single piece of machinery that will actually get Americans excited about the Acura brand: the NSX. Not just interested in, mind you, but excited about. The original NSX debuted 25 years ago next month, redefining the supercar paradigm in the process and creating a vehicle that changed people’s perception of the Honda brand. Now the second-gen NSX will come out under Honda’s luxury brand, Acura, but they are ensuring the mid-engine supercar reflects all of the touch points that made the original legend so respected. This is the car that Ferrari allegedly bought and took apart piece-by-piece, in order to emulate the level of exact execution and finish. Some argue the NSX is the car most responsible for elevating the storied Italian marque from maker of exotic but flawed performance machines into the maker of exotic but flawless performance machines. And that clearly starts with the second gen NSX. The NSX Concept originally shown back in 2012 was considerably different from the final dress version that Acura unwrapped today. Through the car’s development it has gone through a number of different powertrains, and even a major engine placement switch. The second gen NSX has flirted with a naturally aspirated V6, and even a V10 — mounted on the front, no less, to the great consternation of NSX purists everywhere. But that has all changed considerably, with Acura moving from a transverse-mounted engine to a longitudinally mounted one. Oh, and they also bolted on twin turbochargers, and developed a first-in-class 9-speed dual clutch transmission. 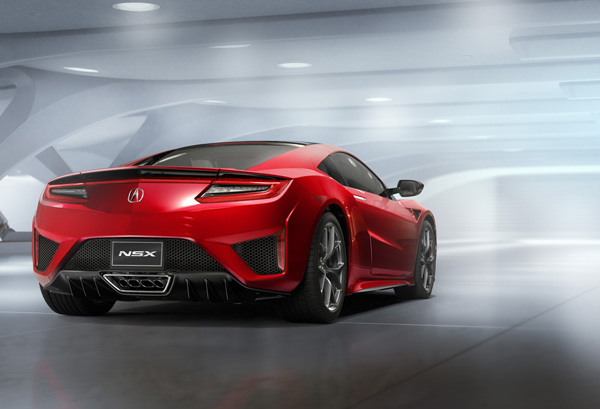 Playing somewhat coy with final figures, Acura said only that the NSX would boast “over 550 hp”. In the process of swallowing the extra motors and gears, the new NSX has swollen an inch wider, 0.8 inches longer in wheelbase and 3.1 inches longer overall. It has also grown 0.6 inches taller. Like the OG NSX — which stakes claim as the first all-aluminum production vehicle ever — the 2016 NSX features world-first materials and innovative constructions. Its multi-material chassis is comprised of an aluminum intensive spaceframe complimented with the strategic use of high-strength steel and carbon fiber. Not only does this provide great rigidity, but it also offers Best In Class center of gravity. Combined with the all-aluminum suspension and SH-AWD, the NSX should boast superlative handling capabilities. Other niceties include carbon ceramic Brembo brakes (six-piston up front, four-piston in the rear), heritage taillights, paddle shifters, launch control and a dial-operated Integrated Dynamic System (with Quiet, Sport, Sport+ and Track modes). Acura will begin accepting custom orders for the new NSX starting this summer, with deliveries expected to begin later in the year. Pricing has yet to be officially set, but expect a starting tag in the mid-$150.